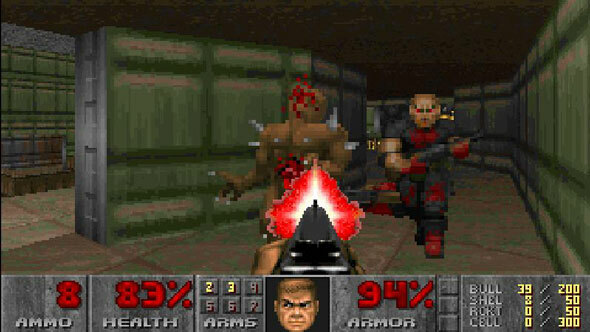 The world speedrunning record for Doom’s famous first level, Hangar (also known as E1M1) has just been broken after over 20 years. That record was set at nine seconds by Thomas Pilger way back in 1998, and while it has been matched many times since, it was long thought to be unimproveable. Until this year. After “tens of thousands of futile attempts”, a speedrunner named 4shockblast has posted an eight-second time on Hangar. You can watch the run in full – as brief as that may be – in the video below. Amazingly, 4shockblast notes in the description that there may be ways to further optimise it: “one major thing to look into is a closer cut on the turn into the zigzag room,” for instance. Word of the achievement reached us via Karl ‘Sim Threat’ Jobst, a legend in the speedrunning community known for his records in Goldeneye and Perfect Dark. His video on what 4shockblast has pulled off here contextualises the feat and breaks down just why it’s so impressive, drilling right down into the detail of strafe-running, preserving momentum, door timings and so on, all with the infectious passion and knowledge of an expert on the subject. Check it out here. We took a look at the world of speedrunning back in 2016, but there’s always more to say. The techniques involved vary hugely, but perhaps not as much as you might think – the biggest changes seem to happen from engine to engine more than from game to game. Then you’ve got to plan a specific path through a level, looking for every place to save time, before the final challenge of actually executing on that. There’s also a big element of luck, in that an NPC with the wrong idea can easily get in your way. It’s fascinating to watch, which explains the appeal of events such as those hosted by Games Done Quick – speaking of which, here’s the SGDQ 2019 schedule. Highlights for PC gamers include Borderlands 2, Prey 2017, Titanfall 2, Skyrim, classics such as Quake and StarCraft, and perennial speedrunning favourites such as Dark Souls and Half-Life.